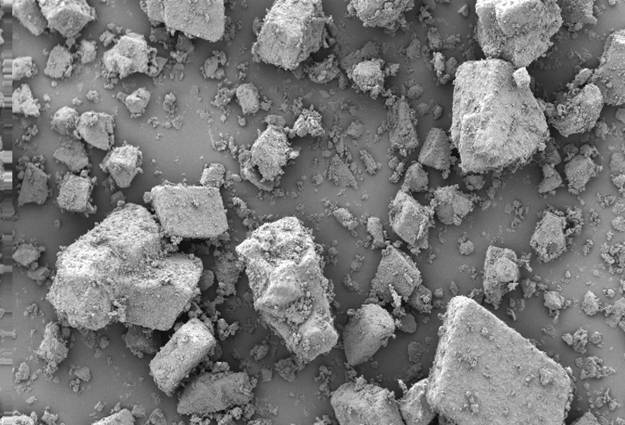 Scanning Electron Microscopy (SEM) with Secondary Electron detector is used in visualisation of crystal shape, surface morphology and structure of particles or agglomerates and the evaluation of product surface characteristics. Typical size range is ~0,1 µm to a few mm. Particle Analytical applies a Scanning Electron Microscope equipped with detectors for Secondary Electrons and Backscatter Electrons. The backscatter detector is designed to analyse for differences in molecular density. With the backscatter detector it is possible to visualise e.g. compositional density differences in a granule or tablet. Instrument Scanning Electron Microscope (Leica Stereoscan 360) equipped with detectors for Secondary Electrons and Backscatter Electrons. Sample requirement The substance or the object must be coated with conducting material (e.g. Au) to reflect electrons (sputter-coating). The sample must be dry.